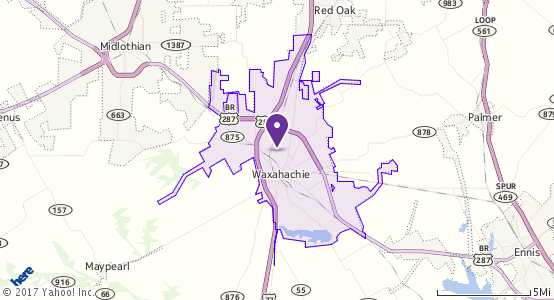 Waxahachie is a city located beyond the southern suburbs of Dallas, in Ellis County, on Interstate Highway 35 and U.S. Highway 287. Nicknamed the gingerbread city for its rich architecture and several beautiful homes, Waxahachie holds an annual tour highlighting the Victorian style houses. The Historic Downtown District is made up of the famed Shawnee Trail which attracts many visitors and is home to a plethora of antique shops, restaurants and boutiques. The district also features a drive in theatre, Scarborough Renaissance Festival, a Halloween Theme Park, Sugar Ridge Winery, a farmers market, and much more. The, “Picture Perfect,” breathtaking beauty of Waxahachie is home to 30 motion pictures and 3 academy awards. Waxahachie is truly a magnificent place to live and be entertained. Not only is Waxahachie home to Southwestern Assemblies of God University, but is also served by Waxahachie ISD. This district proudly carries a tradition of excellence among a diverse student population of 8,000 who rank among the top in academics, athletics and fine arts. Offering 16 Career and Technology pathways as well as producing National Merit and Advanced Placement scholars, WISD is committed to supporting and empowering their community of learners for success. To discover more reasons why Waxahachie provides a culturally rich and unique living experience, see the links below.